SUBSCRIPTION boxes are fun as hell. For a pretty nominal fee you get a (curated) grab bag of products delivered right to your doorstep. What’s a little premium for measured doses of surprise, suspense and convenience? It can’t be denied, though – most of the services out there cater to the ladies. Which is why we’ve ferreted around a little for these services we’re pretty sure a dude will dig. Craft beer. Enough said. Perhaps the best part about being (or becoming) a craft beer nut is the discovery aspect, and the folks at Thirsty have been serving up curated surprises in their subscription cases for years. From lagers to IPAs, you’re bound to find something to get hooked on in their vast collection (following which, you can straight up buy out of their online store). The most basic plan sends you a case of 6 bottles every month for three months. At $135, that averages to $7.50 a pop – not bad at all, considering curation, delivery and taxes are inclusive. Audiophiles rejoice – double that if you already have a record player handy; US-based Vinyl Me, Please ships to Singapore. In each monthly box you’ll find a freshly-pressed limited edition coloured vinyl EP to throw on the platter, plus a couple extras depending on your sub plan. Each EP will mirror a full album by artistes that fall into three categories – essentials, classics and rap & hip-hop – but you always have the option to tweak what you’ll be receiving that month. This local company is ominously named. By opting into their subscription packages, you run the risk of falling in love with their delicious coffee blends… and encouraging your caffeine addiction. Worse yet, they actually allow you to customise the interval of your deliveries. Delivered within a week of roasting, the beans from Hook Coffee are responsibly sourced and the brand’s on track to becoming a hundred per cent Direct Trade. Taste good, feel good. How’s having a stylist pick out tasteful clothing and accessories for you sound? 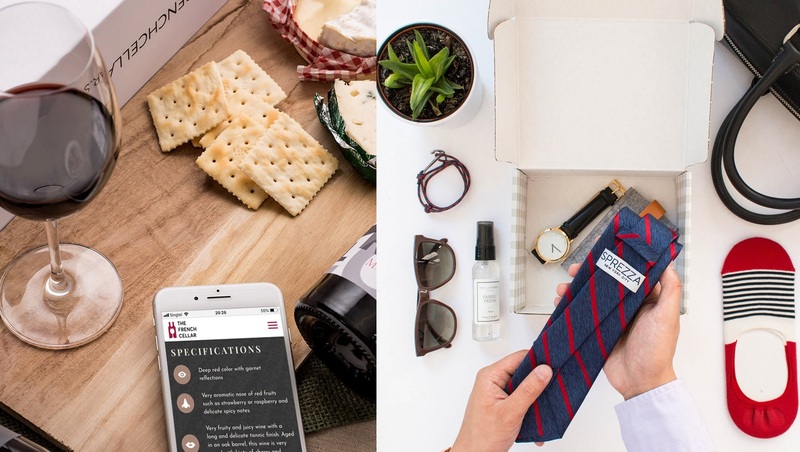 That’s exactly what New York-based Sprezzabox delivers to some 150,000 customers around the globe. Among the goodies in each monthly box are the occasional pocket square, tasteful pair of socks, lapel pin, tie and even sunnies – all curated to make a dapper (and on-trend) gent out of you. Shipping to Singapore isn’t even that expensive – sign us up. P.S. The ‘sprezza’ here is likely a contraction of sprezzatura, the informal Italian slang that loosely means nonchalant, slightly off-kilter style. Shopping for wine can be therapeutic, but if you’re constantly tuckered out by business travel and were never afraid of experimentation, you may as well pay a sommelier to curate for you. The French Cellar’s been around for a fair while now, and that’s a testament to their consistent quality of wines and a happy customer base. Three plans avail themselves to you – Vineyard Gems gets you underrated bottles at great value, while the high-end Grand Crus plan foists rarer bottles from labels that command a premium. All plans deliver two bottles per month.